A startup business needs to decide how the equity in the business is divided. This startup equity calculator can be used to help estimate the amount of equity each founder and investor receives. The situation is complicated by the fact that the founders, in addition to their cash investment, also need compensating for other matters such as the original idea, the amount of time they invest in the business at reduced or zero paid salary, and factors such as their contribution to the business plan, domain expertise, commitment and risk, responsibilities etc. Based on the information provided, this simple startup equity calculator calculates the percentage equity each investor and founder should receive. The calculator allows for up to five investors and two co-founders. The startup equity calculator is used by entering details of each investors and founders cash investment in the business. In addition, for each founder, the business needs to consider how to calculate sweat equity. Sweat equity can be used to reward employees, and allows a cash strapped startup business to pay lower than market rate base salaries in return for sweat equity. The startup equity calculator allows for a three items in the sweat equity calculation. A percentage to be allocated for the original idea, this percentage is based on the total amount of cash invested by the founders and the investors. Compensation for time spent at reduced salary levels is allowed for by entering a rate equal to the difference between the market salary and the amount actual paid, together with the number of months the founder spends at this reduced rate. An additional line is also available in the calculator to allow a fixed amount for such items as their contribution to the business plan, domain expertise, commitment and risk, responsibilities etc. The startup equity calculator is available for download in Excel format by following the link below. 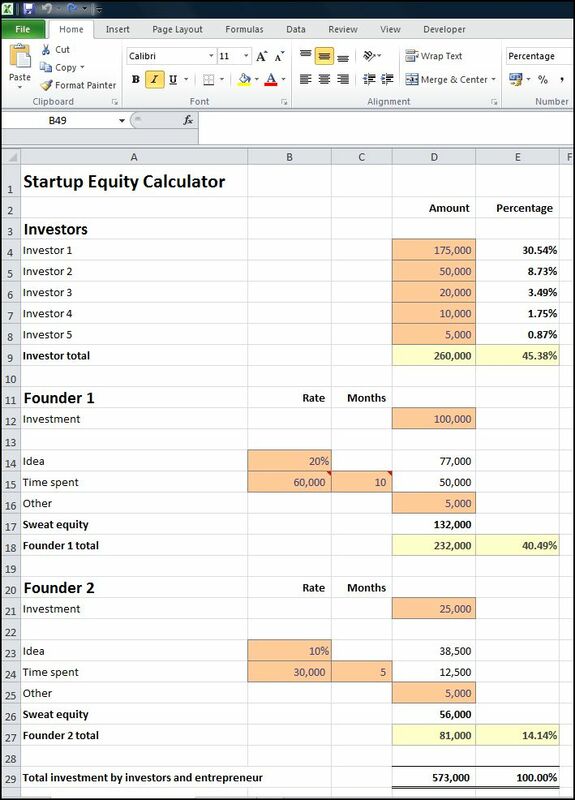 Users use this startup equity calculator template at their own risk. We make no warranty or representation as to its accuracy and we are covered by the terms of our legal disclaimer, which you are deemed to have read. This is an example of a startup investor equity calculator template that you might use to calculate sweat equity and equity percentages. It is a purely illustrative startup equity analysis. This is not intended to reflect general standards or targets for any particular company or sector. If you do spot a mistake in the startup founder equity calculator, please let us know and we will try to fix it.